TEMAGAMI, Ontario — Sometimes time flies, and others it seems to pass itself by. This annual trip to picturesque Lake Temagami is much like that. New is everywhere, and Temagami is not immune to technology, the human need to go faster, and an equal need to make an ever-shrinking wilderness less wild, easier and with more creature comforts. Fifty-plus years ago, I stepped back even deeper in history each time I visited Bear Island, a native settlement based on a heavily wooded island near the hub of Lake Temagami, a multi-legged expanse of crystal clear water and densely wooded shorelines. There were few buildings then but each had a significant part in the lives of the First Nation residents and their surroundings. The one most evident in my memory was the dockside Hudson’s Bay trading post, where a boy could drool over thick wool blankets and the gear of serious fur trappers. The trading post burned to the ground and no structure built since has even a sliver of the character, regardless of its function and woodsy design. The trading post played a huge part in the history of Temagami, as did every other piece and parcel of the fur trade. In younger years we would find our way to hidden lakes, toting our ancient canvas-covered canoe and fishing gear along winding forest trails, those ribbons of footpaths developed by the trappers who hacked out their livings in the lonely shadows of birch, pine and cedar. Another significant piece of Temagami’s past was the many fishing camps and youth summer camps based on islands scattered around the lake. In the late 1800s until the more rapid changes of the mid-1900s, fishing camps served fine meals in a dining hall, native guides entertained anglers, and large, multi-passenger boats would ply a near daily route from town to even the most distant of watery destinations. And during the short summer, boys and girls, mostly from the U.S., would earn their stripes at the many camps where a gutsy kid could canoe and hike the same back country that fed the trappers of past times. Then, we fished with casting rods, braided lines, and June Bug spinners. We lit our nights with Coleman lanterns, and slept under Hudson Bay blankets. We pumped water by hand, fished from wooden boats, and filled an ice box with chunks of ice cut from a frozen lake months before. Then and now, some things stay the same. The same sky filled with stars, the same lake water boiled to make safe and perked to make coffee, the same comfort and hope that radiates from a nightly gathering around the stone fireplace. 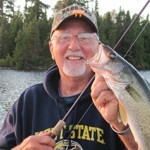 To this Temagami fan, there is no finer place to be, no better place to return to, and no greater treasure to protect. Next articlePlease tell me you remember, right?? What a lovely tribute to an amazing place !! Our family also has old roots visiting Temagami, only going 30+ years, always alluring & attracted to the wild and clean deep lake ! !